Our vision for changing “business as usual” politics starts and stops with people. That’s why CCI Action is about taking on the corrosive influence of big money special interests. And, that’s why CCI Action is about energizing, engaging, and bringing real people into the center of our political system. 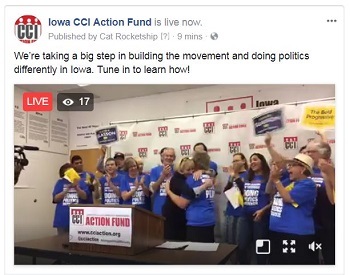 That’s how we’ll win an Iowa that puts clean water first; that serves the common good not corporate ag or big oil; where we stop wage theft and racial profiling; and work to make sure Iowans get paid a living wage. Nobody’s going to move that agenda for us. It’s up to us to engage and deliver. We have to build political power to win. We’re happy to announce we’ve found a gubernatorial candidate who agrees with us. We’re endorsing Cathy Glasson for Governor! Commit to Caucus for Cathy on Monday, February 5 –>> click here! We’re with Cathy … and the movement! This endorsement is a big step for us. It’s not a decision we made lightly. This endorsement came at the end of a two month process, led by a 27-member endorsement committee, that included a candidate questionnaire, four in-person candidate screening meetings, a member survey, and lots of discussion. She’s a longtime CCI Action member and union organizer with a history of fighting alongside everyday people on movement issues. She knows we need to do politics differently. She knows elections are an opportunity to engage and build the base of people needed to push our issue fights once she’s elected. Most importantly, she shares our understanding that no single candidate will solve the problems facing everyday people. She agrees that in order to win on the issues that matter most to us, we need a movement of Iowans standing up, speaking out, engaged, and active in their communities, and in the streets, 365 days a year – not just at election time. Cathy’s campaign is an opportunity to build the movement and do politics differently! Join us for this exciting next step in our organizing to put People & Planet First! You’re the most important part of CCI Action! Your involvement and support make big change possible. Click here to say I’M Caucusing for Cathy! Help lift up our key issues and push our political system in a new direction. Help make a bold statement about what politics and elections can look like. The Des Moines Register called Cathy’s campaign “an emerging dark horse” in the race. We know it! We’ve been filling rooms across the state with new supporters. We’re fighting for Cathy. And when we fight, we win. Let us know you’re in! Chip in to support this exciting new campaign and help us change “business as usual” politics here on the ground in Iowa day after day, year after year. Ross Grooters wins Pleasant Hill City Council race! Read more about our work in movement politics.